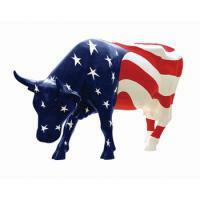 Americow the Beautiful | CowParade New Figurines | One Price Low Flat Shipping! From the Cow Parade New York City Collection, Americow the Beautiful. Designed by artist, Pauli Suominen. Featured at the CowParade New York 2000 exhibit. Made of ceramic. 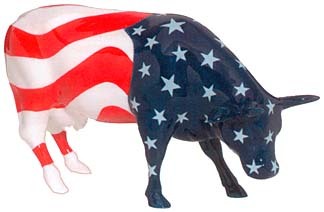 Measures: 4" x 6"
This patriotic cow figurine is painted with the American flag's red, white, and blue colors complete with stars and bars! Brand new in original box.